Earnings were better than expected, but the company isn't out of the woods yet. What: March marked another volatile month for 3D printing stocks. Shares of 3D Systems (NYSE:DDD) finished the month 36.9% higher, fueled by its fourth-quarter earnings that exceeded Wall Street revenue expectations. Rival Stratasys (NASDAQ:SSYS) finished March 27.9% higher. So what: To recap, 3D Systems released preliminary fourth-quarter earnings in February, before the final results were released in March. 3D Systems' final fourth-quarter revenue fell 2% year over year to $183.4 million, which translated to an adjusted profit of $20.9 million, or $0.19 per share. Sequentially, 3D Systems' fourth-quarter revenue increased by an encouraging 21% compared to the third quarter. Considering Wall Street expected 3D Systems to generate a mere $161 million in fourth-quarter revenue prior to its preliminary earnings, it was a solid beat for the company. 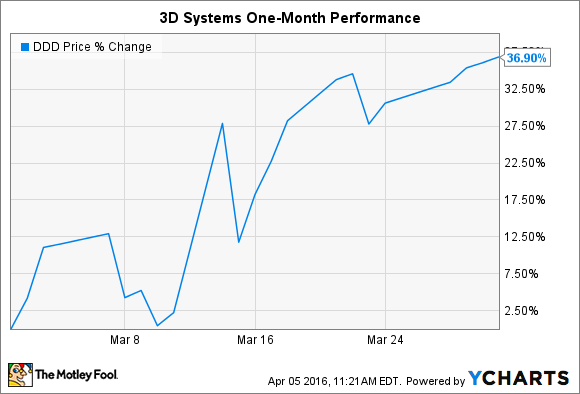 Despite the headline beat and stock surge, 3D Systems' hardware sales fell 16.1% year over year, underscoring continued softness in customer spending. Throughout 2015, 3D printing spending slowed considerably across the industry, which Stratasys believes was caused by an oversaturation of 3D printers already in the marketplace. Ultimately, weakness in 3D printing hardware undermines the long-term promise of 3D Systems' razor-and-blade model, where 3D printer sales fuels recurring sales of high-margin materials to help drive earnings growth. Now what: Although 3D Systems beat Wall Street expectations, the company does not appear to be out of the woods yet. Management is in the process of conducting a comprehensive review of its entire business, and it expects continued softness in customer demand to persist. Until there's more clarity about industry demand and progress of 3D Systems' restructuring efforts, investors are probably in for more volatility.